Welcome to Ruffin' It Pet Resort! 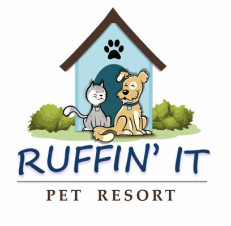 Ruffin' It Pet Resort specializes in dog day care and overnight boarding for dogs & cats. With 11,000 sq. ft. of indoor space and 3,500 sq. ft. of secured outdoor space for our guests to run, play, and socialize. We're passionate about your pet's comfort, safety and happiness. Our staff is trained on animal behavior and safety as well as certified in pet first aid and CPR. You'll feel comfortable leaving your family member with us for the day or night. Your pet will feel like part of our family.